One of the things I enjoy most about this blog is the dialogue it opens with readers. I am especially fond of times when people send me blog ideas because it shows that they are not only reading but thinking, too. On occasion these blog ideas are ones I can't touch (mostly for legal reasons, as some would get me sued in a heartbeat) but often these ideas are stellar ones that I become quite anxious to share. Recently a friend sent me an email suggesting a blog post, and once I read the idea I was not only intrigued but excited. You see it was about art, and sustainability, and community. What is that a picture of, you might ask? It looks like a giant lit tree surrounded by stationary bicycles, doesn't it? And in fact that is exactly what it is, but it is more than that. It is a giant art installation in Durban, and those bicycles power the lights. It is interactive sculpture, and it is people-powered. The person who suggested the blog topic also suggested that something like this might be perfect for Fort McMurray - and I happen to agree. You see we have this massive city centre redevelopment under way now. Every day brings new signs that transformation is coming, and we have this huge, gorgeous waterfront that is just begging to be redeveloped to showcase the natural beauty of this region. One of the things I am adamant about, though, is that part of this redevelopment needs to be art, because art is a very fundamental part of what makes us human. Art is what we do to play, and where we express our creativity. Art is what makes our hearts sing. One of the tenets of this new redevelopment is the concept of sustainability. It's a term you hear a great deal, and the idea of sustainable art is not new, either. 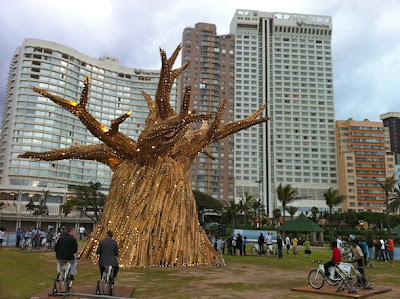 This idea, though - an artwork installation powered not by the natural resource of oil but rather by the natural resource of people - intrigues me. There is something collaborative and collective about it, too, something very community oriented. In my mind's eye I see families and adults and children gathered around powering a giant artwork of some sort, making it light up or even play music. This isn't just about sustainability, but about community. I can see late nights down on the newly redeveloped Snye, residents walking for the pure pleasure of being outdoors, and coming upon a sculpture that lights up the night, one powered by our greatest natural resource - people. And you know it doesn't have to be a tree. I suppose I envision something that looks like waves, echoing the northern lights, lit in ribbons of shades of green. I envision it glowing softly at first as people power starts the lights, and then growing into a display that rivals the northern sky above. I suppose I see us pulling down just a tiny bit of those northern lights to the earth, and making them dance for us as we provide the power. There is something beautiful and magical about this, I think, and something that not only shows sustainability but the power of community. So, today I have in my head this art installation inspired by an email and a little project in a city across the world. In this community where everything is possible, where innovation and creativity are abundant, and where we are exploring the ideas of sustainability and community this idea has captured my attention, and my heart. I think art that we look at isn't quite enough in this case. I think the time for interactive art, sustainable art powered by community, has come - and I think it is right now, just as we find ourselves on the cusp of dramatic transformation. I think we could become a world leader in the concept of sustainable, people-powered art. I think we could light up the night - and have it noticed in a country far away, just like this little tree made its way to Fort McMurray through an email, and an idea. One day it could be our art installation inspiring others around the world when someone spies it on a website and says "look at this cool thing they did in this place called Fort McMurray in Canada..."